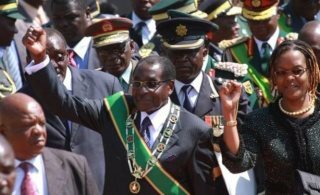 AFRICANGLOBE – It is a fact that the West succeeded in sabotaging Zimbabwe’s economy for the simple reason that their kith and kin controlled the economic levers, and with the assistance of the proxy party they sponsored here went a step further by using alleged closure of democratic space as anexcuse to impose ruinous economic sanctions on our country. While Westerners tried to mask the real reason they were imposing the sanctions by parroting the neo-liberal platitudes of electoral democracy and the rule of law; the sanctions were imposed to stymie democracy manifest in Government’s decision to empower people to participate fully in all facets of the national economy. And now that it is clear that no matter what we do, Westerners will not remove their sanctions, it is time to give them a taste of their own medicine by sanctioning them out of our economy in line with the indigenisation and economic empowerment drive. True to the Zanu-PF campaign theme of Taking Back Our Economy by Indigenising, Empowering, Developing and Creating Employment, it is time to take control of the economy in toto so that outsiders will not manipulate it again for their selfish political ends. And this is where the Zimbabwe Agenda for Sustainable Socio-Economic Transformation (Zim Asset), which is a crystallisation of Zanu-PF’s winning manifesto, President Mugabe’s inauguration address and his speech during the official opening of the First Session of the Eighth Parliament comes in; as it aims to put Zimbabwe, the asset, in the hands of Zimbabweans. Just like any other programme, the success of Zim Asset hinges on funding; and there is no doubt in our minds that the West’s ruinous sanctions regime will affect the implementation of the programme which is why all those who lay claim to national leadership in Zimbabwe must raise their voice against the Western embargo. It was thus refreshing to hear MDC-T deputy organising secretary Abednico Bhebhe say as much in a question to finance minister Patrick Chinamasa in Parliament last week. Said Bhebhe: “The question I want to pose to the Minister of Finance is, you projected a GDP growth of 6,1 percent but those sanctions are still there. “How then do you expect a growth of 6,1 percent when you have not dealt with those sanctions? And it was equally disappointing to see that in the case of the mongrel president of Botswana Ian Khama, a bird always sings the same song as he has once again been prodded by his Anglo-Saxon uncles to bad-mouth Zimbabwe ahead of the pending review of the EU sanctions regime next month. The Botswana leader has once again cast aspersions on our elections, and he has done this almost every year and it is obvious to anyone with at least a double digit IQ that the man is a mere megaphone of forces he identifies with more than he does his paternal parentage. However, just like everyone else, Khama is entitled to his opinion but we take great exception when that opinion is peddled at the expense of the aspirations of an entire nation. We urge Mr. Khama to solve the multi-faceted challenges confronting his country that has impressive development indices that are not matched by livelihoods. Zimbabwe does not suffer the delusions of outsiders dreaming of punching above their weight. We thus urge all Zimbabweans across the political divide to speak with one voice against the sanctions so that outsiders with ulterior motives do not find excuses to flaunt their subversion.